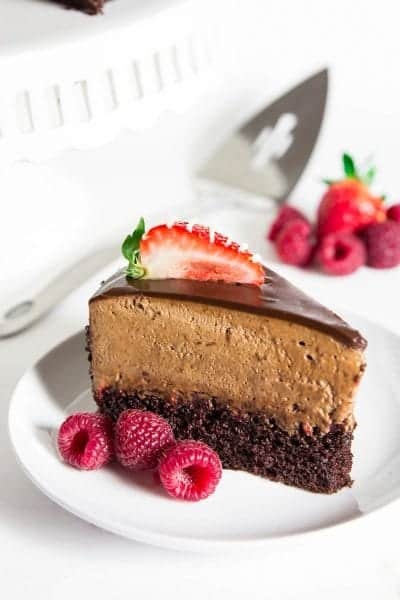 This Chocolate Mousse Cake Recipe with Raspberry has all the flavor you desire in a decadent dessert! A moist chocolate cake base, rich and creamy mousse, and a little bit of tartness from the raspberry jam will make your mouth water. We are major chocolate lovers, so you already know we have more chocolate cake recipes like this fudgy Nutella cake, chocolate honey layer cake, and drunken chocolate cherry cake! You will absolutely fall in love with this chocolate mousse cake recipe! The key to perfect the chocolate cake portion is using Dutched Cocoa. Hershey’s won’t make the cut in this recipe. Dutch processed cocoa powder has a lower acidity which results in a more rich and dense cake, with less bitterness and a darker color. Trust me, this cocoa will change the whole cake. It’s a must! Since this is a mousse cake as well, it calls for heavy whipping cream. If you prefer a more dense mousse use 40% fat heavy cream (Costco has it). If you don’t mind a slightly lighter mousse, use 36%. But you don’t want to use anything lower in fat. The mousse won’t set very well and it will be a struggle to cut through it nicely. For the complete list of ingredients with measurements, see the printable recipe below. Spread raspberry jam over prepped and cooled cake. Prepare the mousse mixture and spread over the top of the cake and smooth as needed. Chill to set. Before serving, but once cake and mousse have chilled sufficiently, make ganache and add over top of the cake. Chill and decorate as preferred with fresh berries or mint. A few simple fresh berries and mint make a beautiful yet simple topping to this rich cake. 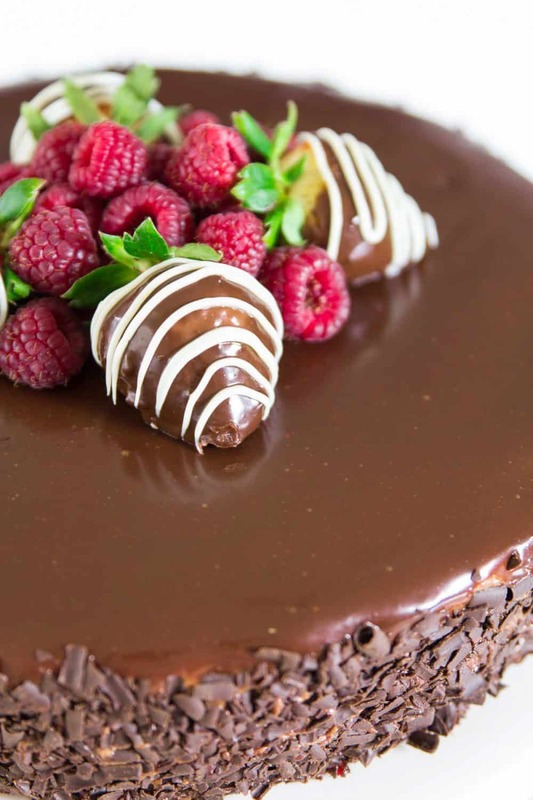 This chocolate mousse cake recipe featuring a layer of tangy raspberry jam is a wonderful addition to your baking skills. While it does take time to cool and set, the individual layers are easy to create. This is a perfect option for making for any event. Below are some more of my favorite cake recipes to help you satisfy your craving for something rich and sweet. In a large bowl sift the flour, baking soda, baking powder, salt, sugar, and Dutched cocoa powder. Add the 2 eggs and whisk them in. Then mix in the buttermilk. Line a 10 inch round baking pan with parchment paper and spray with non stick spray. 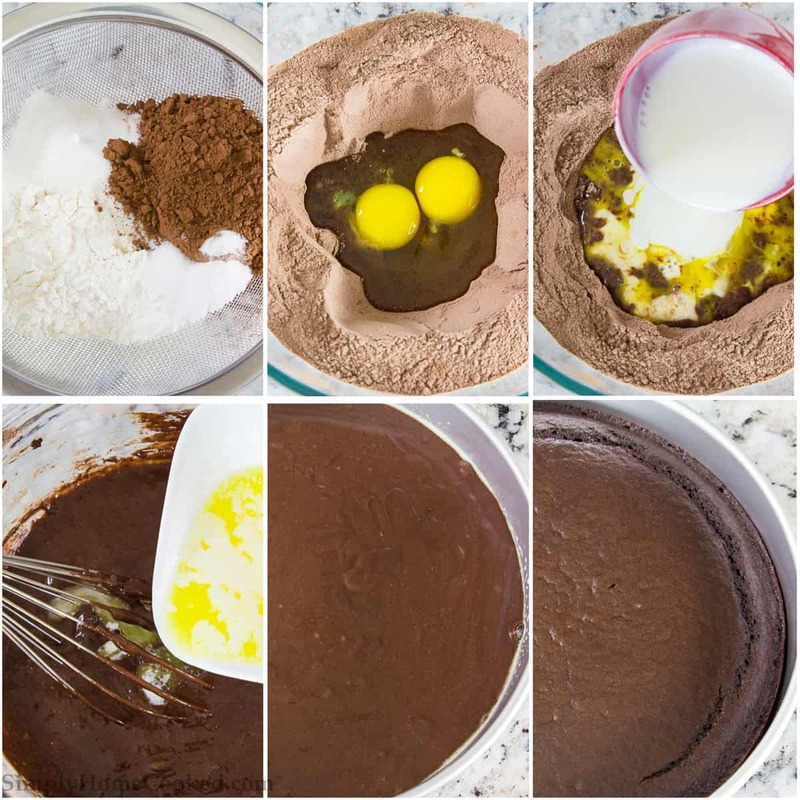 Pour the chocolate cake batter into the pan and bake at 350 degrees Fahrenheit for 18-20 minutes. Once it's baked flip it onto a cooling rack. After the cake is completely cooled, slice off the top "dome" portion of the cake using a serrated knife. This will help ensure a smoother flat top to the final cake. You can go ahead and eat the top that's been sliced off. Place the cake on the platter or cake stand you plan to serve it on. Open up a 9 inch spring form pan and remove the bottom of it. Place it directly on top of the cake making sure to squeeze every bit of the cake inside. The springform will help hold the mousse together until it stiffens. Melt 2 1/2 cups semisweet chocolate chips. Let them cool for about 2 minutes. Beat the heavy cream on high speed right before stiff peaks form. Add the melted chocolate to the heavy cream while continuing to mix. Pour the chocolate mousse on top of the raspberry jam and smooth it out with a decorating spatula. Chill in the refrigerator for at least 5 hours. 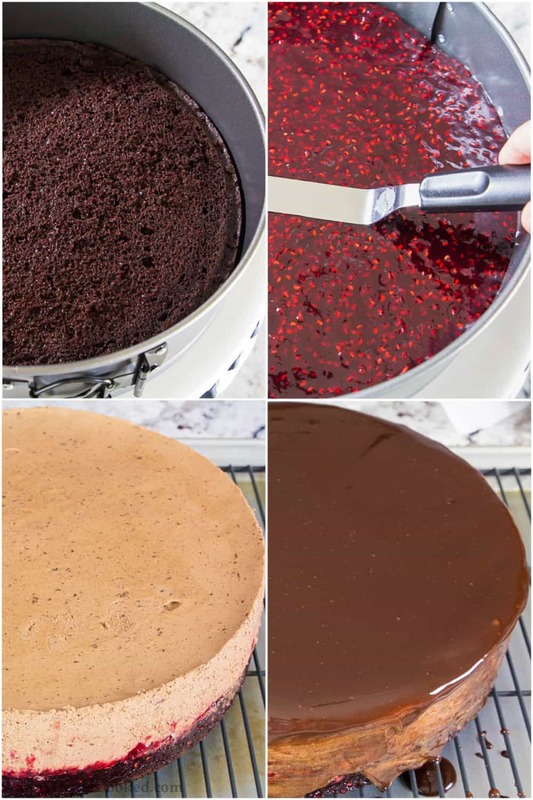 After the cake has chilled and the mousse has set, slowly remove the springform and transfer the cake to cooling rack with a baking sheet on the bottom to catch all the extra chocolate that dips off. In a saucepan, bring 1/2 cup of heavy cream to a simmer. Pour it over 1 cup chocolate chips. Let it sit for about 1 minute then stir until smooth. Pour the chocolate ganache over the cake and chill in the refrigerator for another hour or until the ganache sets. Decorate the sides of the cake with anything you want. I used finely chopped chocolate. This looks divine! I am going to try it exactly as you instructed but also wonder what to do for a sugar free version? We tried a sugar free chocolate raspberry mousse cake at a bakery in the Paris hotel, Las Vegas and the hubby loved it; which means I need a recipe to try for his upcoming birthday! Hi Phuong, I’m so glad you came accross this recipe 🙂 A great sugar free substitute would be erythritol (I used swerve brand). And for the raspberry jam, just use a sugar free raspberry jam. I hope you and your hubby enjoy this recipe! I made this for my daughters birthday! It was a hit so rich and flavorful thank you! I bake very seldomly but your recipe was to the point and easy to follow and it turned out great! Wow, thank you for your kind words! I am so happy to hear you love this cake recipe so much. Do you think the cake would be okay in the fridge for 2 days? I would do the ganache the day of. Thanks! Looks wonderful! Hi Annie, thank you! I’ve never tired making this cake in a smaller cake pan so I can’t say too much about how well it will turn out. I made this for valentine’s day and it’s absolutely delicious! My husband is a chocolate lover and requests only that so I’m always on the hunt for new chocolate cakes. This was rich and delicious….the Raspberry goes very well with it. We added sliced strawberries on top and it was perfect….thank you for the recipe! 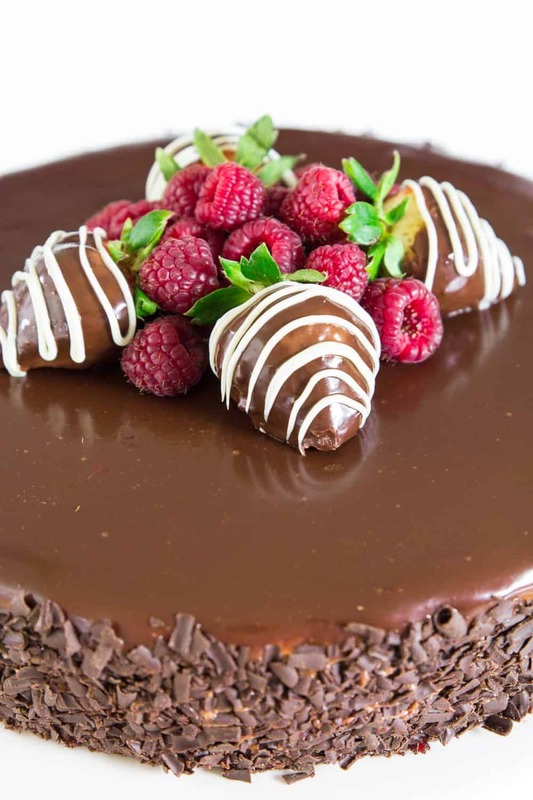 I actually attempted to make this cake, my cousin said it should be sold at our Russian store… I did change some things to my liking but overall very chocolatey and the raspberries go so well with chocolate! I didn’t have a 10″ baking pan so I baked my chocolate cake in a 9″ pan and it worked out just fine with the springform rim. My cake didn’t look as pretty as yours as I didn’t pour the ganache over all the cake but just spread it out while still in the springform. So when I removed the springform pan you could see all the layers (cake, jam, mouse and ganache). Very creative, thank you! This looks marvelous! I’ve never made a mousse cake before, so your discussion of the types of ingredients was really helpful. I so want to try this! How beautiful! Great Job!